Originally Published in DeneenBorelli.com on 6/25/14. The Washington, DC establishment is up to their old tax raising tricks again. While the media and the public are focused on the Middle East instability and numerous Obama administration scandals, the DC-insiders are churning away at a tax policy that transfers wealth from hard working Americans to the pockets of the well connected. Backed by special interest groups, Senators Bob Corker (R-TN) and Chris Murphy (D-CT) are pushing legislation to increase the federal gasoline tax. 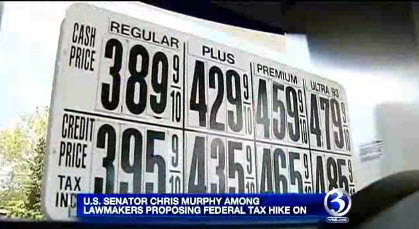 The Tennessee senator, along with Sen. Chris Murphy, D-Conn., wants the 18.4-cents per-gallon federal gasoline tax and the 24.4-cents per-gallon federal diesel tax to each increase by 12 cents over the next two years — and then be indexed to inflation. If the gasoline tax had been increased based on inflation since the last hike in 1993, it would stand at 30 cents now, about where Corker wants to put it. Of course, the tax raising measure has support from big business including the U.S. Chamber of Commerce and labor unions are also on board with the tax. These special interest groups want to cash in on infrastructure spending from the Highway Trust Fund. Outrageously, the Corker-Murphy bill attempts to balance the tax increase by cutting taxes for big business! Efforts to raise the gasoline tax clearly illustrate the dangers posed by DC-insiders where special interest groups are pulling the political strings of puppet lawmakers that dance to their tune. When the political class joins business and labor special interests groups, we the people lose. On behalf of FreedomWorks activists nationwide, I urge you to contact your senators and ask them to support the Transportation Empowerment Act, S. 3190, introduced by Sen. Mike Lee (R-Utah). The bill would gradually reduce the federal gas tax and give states more control over their respective transportation and infrastructure needs. Many states have been discussing ways to pay for road funding. Now, there are two ways to make something affordable. One way is to increase revenue and the other way is to drive down costs. It has been suggested to take a look at replacing the gas tax to be able to afford road funding since the revenue brought in by the gas tax is on the decline while road coasts are increasing. Earlier this year, Gov. Eric Holcomb (R-Ind.) signed legislation to raise the state gas tax of Indiana in order to increase road funding. The move had major support from the leadership of the state Republican Party with Indiana House Speaker Brian Bosma saying “It’s a program that’s responsive, comprehensive, sustainable, and it’s for the next generation.” It seems interesting then that Gov. Holcomb promised to take Indiana to the “next level” since this seems like a step back. Guess Who’s Running Ads for the Crony Ex-Im Bank? Looks like the Chamber of Commerce is opening its coffers for a million-dollar ad blitz supporting the Export-Import bank. The ads will feature small businesses that rely on the Ex-Im Bank to keep their businesses functioning and competitive. Of course, the ads fail to mention that an overwhelming majority of the Bank’s funding goes to large multi-national corporations like Boeing, General Electric and Caterpillar. Never underestimate the power of the big business lobby and the foolishness of establishment Republicans to follow it. In a spectacular example of political shortsightedness and reckless policymaking a few Republicans are mimicking Democrats by discussing the possibility of raising the federal tax on gasoline. Gas Tax Increase: SAY NO!